50% More fuel efficient than traditional generators. If you live in Puerto Rico, US Virgin Islands, Hawaii or Alaska there is a $150.00 surcharge for shipping that will be added on at checkout. 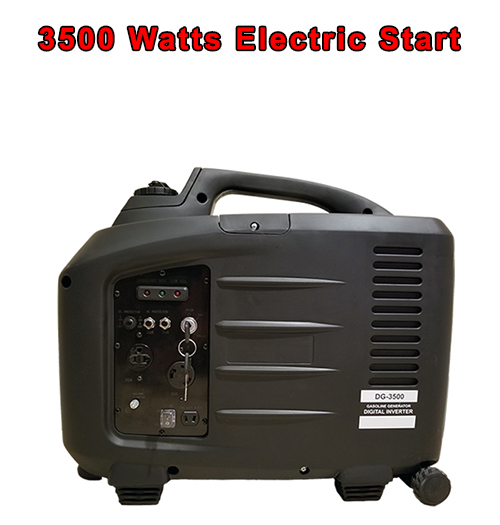 You are looking at the new 2019 Digital 3500watt Pure Sine Wave Gas Generator Inverter with an Electric Key Start and FREE Wheel Kit included! This new upgraded DG-3500 is the most advanced inverter generator with true digital signal processing and pure sine wave output. 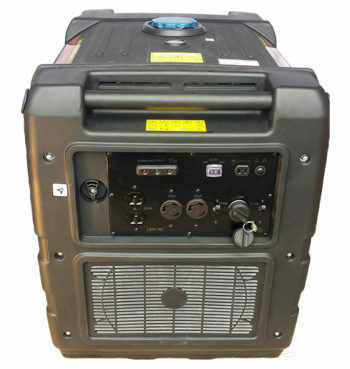 This unit is lightweight, portable, safe on all electronics, 50% more fuel efficient and quieter than traditional generators. This unit with the new powerful 30amp outlet will now run just about any RV AC unit you can hook it up to. We tested this on a big powerful 13,500 BTU RV AC unit that requires 3100 continuous watts and a 30amp outlet and it ran it with no problem. Save up to 50% on gas with our PureWave DG-3500 digital watt generator. You will get up to 7 hours run time on a tank of gas. This generator has been tested with Honda digital generators and performed exactly the same in pure sinewave output, fuel efficiency and ran the same at 65 decibels. The generator comes with a full 1 year free part warranty. We give all our customers a 30 day satisfaction return for refund or exchange warranty. 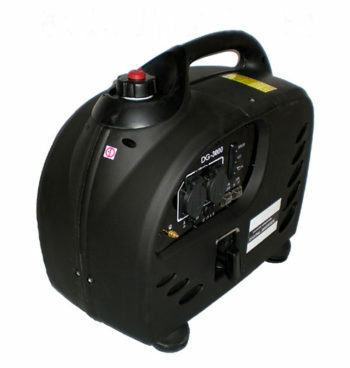 We are always fully stocked on all parts for this generator. Any questions at all please call us at 843-236-3172. Why Buy from Scooter Wholesales LLC? Our company has been around for almost 2 decades. We know our Generators like no other company. We have 24 hour online email support with trained mechanics to help you with any issue at anytime. You can also call us during business hours for help over the phone 5 days a week 843-236-3172. We stay one step above the competition on upgrades and nobody in the USA beats our prices as we are able to sell very high volume of these digital generators and in return we take less profit. Please do your research and you will see we are untouchable on quality and pricing. 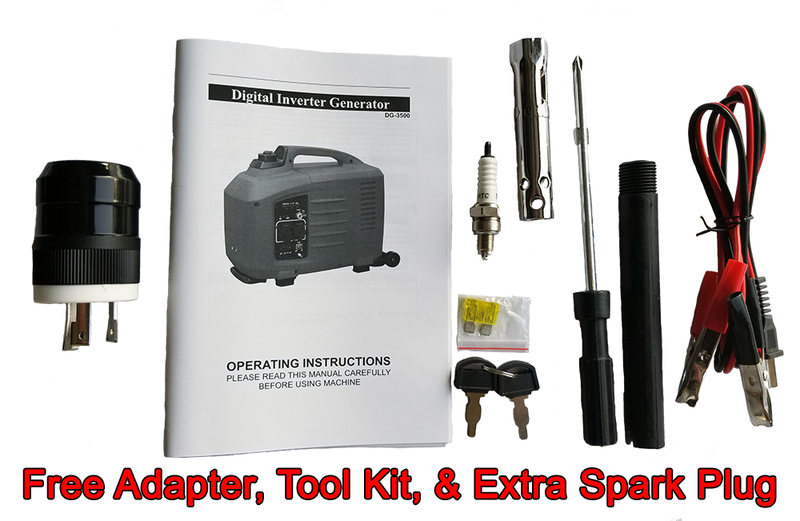 If you find the same new generator for sale cheaper, we will pay you $25 and beat the price. No questions asked. UPGRADED outlets to a 30amp & a 20amp outlet. FOR ANY QUESTIONS AT ALL. Please EMAIL US or CALL US AT 843-236-3172. We take all credit cards over the phone or online with Paypal. If you have used a traditional/conventional generator, you have probably experienced that when there was a fluctuation in the power, the lights dimmed and then went back to full power. This fluctuation of power is quite dangerous to many modern-day high-tech and sensitive equipment. For example, if your computer was powered by a conventional (non-inverter) generator and the voltage fluctuated, the computer would shut down prematurely. This premature shut down not only causes inconvenience, but often leads to loss of unsaved data and files. Furthermore, sudden fluctuations of power can often be fatal to many of these types of equipment. You will not experience this fluctuation of power using an inverter generator. Increased Life Span Due to Decreased Engine-Wear. DG-3500 inverter generators are much quieter than conventional generators. This is because the inverter generators do not run at full speed all the time. As mentioned, the inverter generator is controlled by a microprocessor so it only produces what is needed at any given time. DG-3500 inverter generators are even much quieter than many other inverter generators in the market. DG-3500 inverter generators are equipped with sound dampening insulation materials that further decrease the level of noise even when running at full speed and maximum load. The quiet operation of the DG-3500 inverter generators makes them a perfect candidate for use in RV’s, boats and at campgrounds, recreational sites, exhibition booths and concessions stands. DG-3500 inverter generators produce pure (true) sine wave power, the same type and quality of AC (Alternating Current) power produced by the utility grid. Pure sine wave output is a far superior (cleaner) form of output power as compared with modified sine wave or square wave power. Increasingly, most modern electrical or electronic devices such as laptop computers, stereos, laser printers, sensitive medical equipment, digital clocks, kitchen appliance with multi-stage timers, and variable speed or rechargeable tools can only function properly with pure (true) sine wave power. Similarly, pure (true) sine wave inverter power may be needed for maximum efficiency of inductive equipment, to reduce audible and electrical noise in devices with audio-visual components and to enable proper functioning of fluorescent lights with electronic ballasts. 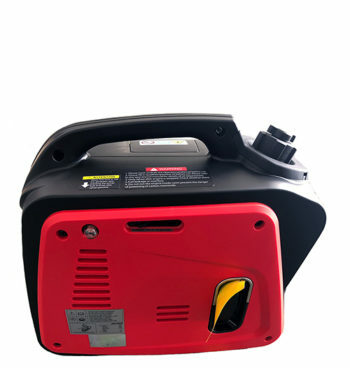 DG-3500 inverter generator’s pure sine wave output provides suitable power for operation of all electronic and electrical appliances and devices, whereas the inferior, conventional generators produce modified or square wave power. These conventional generators are not capable of providing suitable power to many devices. Both the function and longevity of electrical/electronic devices and appliances are improved with the use of pure sine wave power. EASTCOAST WHOLESALES, LLC’s products (DIGITAL GENERATORS) are designed for recreational and commercial use. The User releases EASTCOAST WHOLESALES, LLC, its officers, agents, sponsors and employees from claims, demands and damages (both actual and consequential), of every kind and nature, known and unknown, suspected and unsuspected, disclosed and undisclosed, arising out of or in any way connected with items purchased. In no event shall EASTCOAST WHOLESALES, LLC or its suppliers be liable for lost profits or any special, incidental or consequential damages arising out of or in connection with items purchased from us or this agreement (however arising, including negligence). Our liability, and the liability of our suppliers, to you or any third parties in any circumstance is limited to the User’s cost of qualifying products purchased at the time of entering into the agreement. Qualifying products as acceptable for return as outlined in the return policy. Product information is provided on an “as is” basis, without warranty of any kind, either expressed or implied, including, without limitation the implied warranties of merchantability, fitness for a particular purpose, or non-infringement. The entire risk as to the performance of or arising out of the use of products purchased is borne by the User. EASTCOAST WHOLESALES, LLC makes no warranty regarding the accuracy of information about products. All product information is provided by a third party and is said to be true to the best of our knowledge. All product information available to us is made available to the user. User hereby agrees to defend, indemnify and hold harmless EASTCOAST WHOLESALES, LLC, its officers, directors, employees and agents, for any loss or damages awarded by a court of competent jurisdiction resulting from any claim, action, or demand, including reasonable attorneys’ fees, arising out of or related to products purchased on this web site, or the violation of the agreement by the User. You must inspect all equipment before using it and to take full responsibility for assuring that the equipment is in good working order and safe to use. Customers have read and understood the use of these products before purchasing. Please contact your direct vendor or contact us with any questions. This shall not act a waiver of any implied warranties which customers retain, as provided by law. When purchasing from or submitting an order to EASTCOAST WHOLESALES, LLC, you acknowledge that you have read and understand our disclaimer, and agree to these as the terms of sale. SCOOTER WHOLESALES offers a FULL 1 YEAR free part warranty. This warranty covers factory defects and defaults only. We do not cover misuse or broken parts caused by the user or by any other event. If you have questions about our warranty, please e-mail us. GENERATORS CAN ONLY BE RETURNED WITHIN THE FIRST 30 DAYS FROM THE DATE YOU RECEIVE THE UNIT & IT MUST BE IN GOOD CONDITION & AUTHORIZED BEFORE BEING RETURNED. There is a 10% restock fee on all returns. We will, however, during the 6 month free part warranty period provide you with free parts & we pay the shipping cost on the warranted parts to your house. SCOOTER WHOLESALES will not be responsible for shipping charges on received or refused packages, part returns, or scooter returns. Freight collect and COD packages will not be accepted. If you bid on this auction and win you will be obligated to follow this warranty to the fullest and this warranty will be present in any further issues if such would arise. Everyone will receive a copy of the warranty with the manual. Insured shipping & handling fees are FREE to anywhere in the continental USA. If you live outside the USA email us for a shipping quote before you bid. We accept all credit cards through PayPal or you can call us and pay over the phone.